Digital Identities are the digital representation of an individual or a business conducting financial transactions on the Internet. Our patented eDNA™ technology builds Digital Identities by capturing information or attributes and aggregating them into entities. Attributes are simple descriptive values like name, address, phone number, IP address, geo location, etc. Whereas entities are user accounts, payment instruments, devices, etc, that carry identity semantics and their own risk models. To calculate an identities reputation, Trusted (good); Unknown (behavior isn’t predictive); Suspicious (evaluate further); Bad (proceed with extreme caution), our eDNA™ technology reviews the historical behavior of the entities and evaluates the entities’ risk models. Another fundamental component of eDNA™ is the link across entities. In realtime, entities are reviewed to see if they have been previously categorized in other transactions, and the success of those transactions. These links describe valid relationships across entities, frequency, recency, and carry other important meaning when it comes to analyze the risk of the transaction. 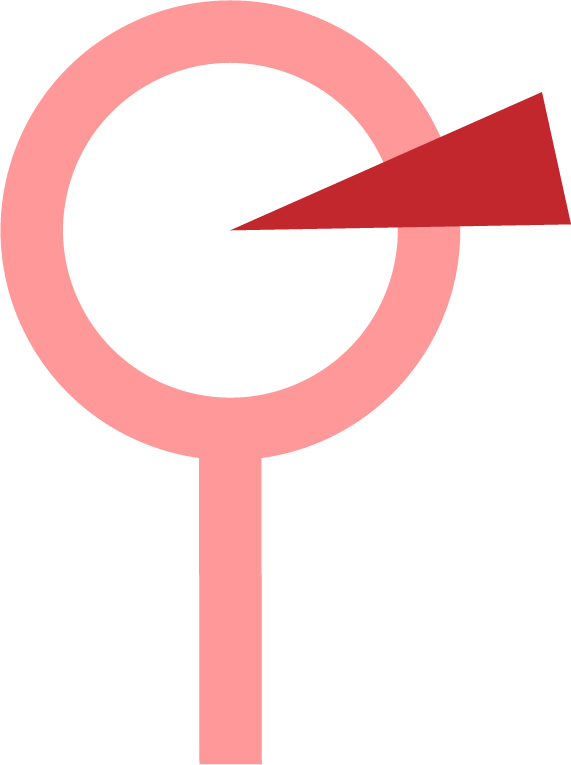 The overall linkage across entities as part of an individual’s eDNA™ builds an Identity graph. One of our e-commerce clients had been running their own very efficient anti-fraud operations. Their chargeback rate was very low, and their manual review rate was already far below the industry average at a healthy 3-5 %. We engaged with them to demonstrate the potential value of reputation analysis on top of their own current practices. After uploading historical data and a few conversations on proper data syncing, we ran our system in parallel. We identified that a large percentage of transactions going into manual review could be readily accepted by looking at the reputation of the identity behind the transaction. In a three-month period,there were 350,000 transactions conducted by individuals with Trusted eDNA™. Only 187 (0.05%) were denied after review, and of those there have only been 12 (0.003%) chargebacks (it is possible some more chargebacks are coming as we are still under the 6 month period).In those same three months, their system flagged over 9,000 transactions for manual review that were conducted by individuals whose eDNA™ was considered Trusted or Good. This accounted for 10% of all their manually reviewed transactions. So they were spending 10% of their manual review time on a group of users who had a 0.05% chance of denial and a 0.003% chance of resulting in a chargeback. 10% of transactions flagged for manual review could have been safely accepted automatically if the client had used reputation data, saving precious time. We also analyzed the following scenario: what would have happened if a significant percentage of the transactions that were denied after review (187/month) had turned into chargebacks, with a high estimated operational cost per chargeback? 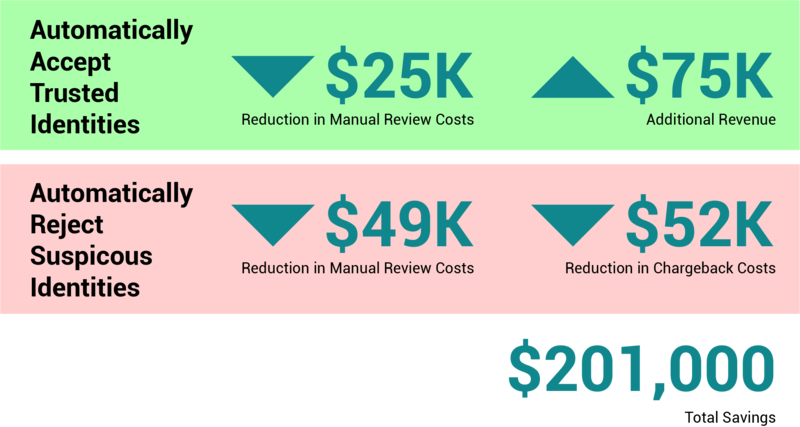 When we add all of these numbers together, just by using reputation on top of their current fraud prevention efforts, the client would have yielded an estimated savings of $201,000 per year with an estimated 25% reduction of all manual reviews. Consistently, across our clients, about 10% – 15% of their customers have trusted reputations in our system. And our data shows that 99.94% of trusted users don’t commit fraud. That is a very healthy opportunity for reducing manual reviews, and for affecting your top line revenue by accepting more transactions. How about the other reputations? Well, Suspicious Users tend to be rejected automatically in 50% of the cases, and another 20-25% of their transactions end up being rejected after review. That indicates that if the user is considered suspicious, 70-75% of the time our clients end up rejecting their transactions. Bad users are – on average – rejected automatically in 84% of the cases, and another 8% is usually rejected after review, meaning that in 92% of the cases they will be denied. A normal client after uploading historical data into our system will see 15% – 20% of their client base in either trusted, suspicious or bad reputation in a short period of time. Are you interested in what your results might be by taking reputation into account? Sign-up below to be notified when our ROI Calculator and Test Drive program is released.